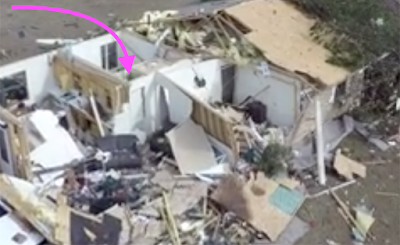 This drone photo, of the damage from Tuesday afternoon's tornadoes, demonstrates an aspect of tornado safety. While a base is best, if your home does not have a basement get into a small room in the middle of the home. The idea is to have as many walls as possible between now and the tornado. In this case, you can see that the closet survives while other rooms. sustain heavy damage.